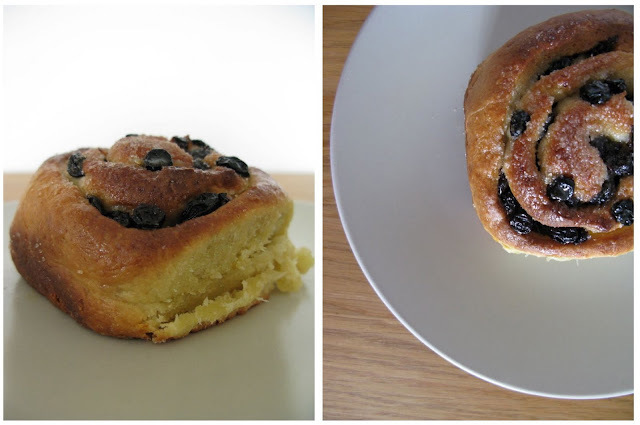 Last week I made Chelsea Buns, based on a recipe from the River Cottage bread book. I made a couple of amendments, and they were delicious! Combine the dry ingredients in the mixer bowl, then add the wet ingredients and mix to a sticky dough using the dough hook attachment. Leave to rise in a warm place for an hour, until doubled in size. Brush the inside of a 30cm square baking tin with a little of the melted butter, and coat with a little of the sugar. Roll out the dough to a rectangle measuring 60 x 40cm. Brush the melted butter all over, leaving a 2cm margin along the top edge. Sprinkle over the sugar and currants. Press the currants into the dough, and then roll the dough into a long sausage. Cut into 9 equal pieces and arrange in the baking tin. Preheat oven to 200 degrees, and leave the buns to prove in a warm place for about 30 minutes. Sprinkle a little caster sugar over, and bake for 20 minutes until golden. Warm the milk and sugar together in a pan, and brush over the buns when you take them out of the oven.